Ruth Ungar Merenda Covers: Tom Waits, Hank Williams, Richard Thompson, Nico & more! In the early days of Cover Lay Down, I spent some time covering the emergence of artists like Teddy Thompson, Rufus Wainwright, and Sam Amidon, all new voices who walked in the footsteps of folksinger parents; more recently, we heard Neill MacColl, son of Ewan and half-sister of Kirsty, in duet with Kathryn Williams, and Ben Taylor as a tagalong in discussion of the life work of his father James. This may seem like a high percentage of “folk kids” for a blog that’s only been around since September. But stepping back and looking around, we see that the prevalence of second generation musicians in Cover Lay Down is not so far off from the natural order of things in the world of folk music. And if the idea of folk music as a family business is not so uncommon, then I suspect much of this has to do with the kind of work that musicmaking is — after all, the artistic muse isn’t one which takes place solely outside of the household, and can be left at the office each evening. As we alluded to in our recent exploration of folk musicians who are also mothers, as an art form and a vocational practice, the work of folk is something which permeates home life. Some forms of folk, like some forms of music, are more open to family performance, of course. In the contradance and traditional folk music worlds, especially, performance is very often something which happens in households and community halls, with families and children; proportionally, you see more kids on (or near) stages in dance performance than you do in latenight singer-songwriter coffeehouses. Sam Amidon grew up in a household like this, where music took place as a daily and family activity, and performance was more often mid-afternoon than anything else. And the family atmosphere which permeated the McGarrigle/Wainwright household is famous for bringing forth Rufus and sister Martha Wainwright as musicians of confidence in their own right. Someday soon, I hope to tackle the phenomenon of three-generational folk families which have their roots in the early American folk resurgence of the fifties and sixties, such as that of Woody, Arlo, and Sarah Lee Guthrie, or the performing careers of the Seeger family, including Pete Seeger’s grandson Tao Rodriguez Seeger, who performed as part of The Mammals with today’s featured artist until the band went on its recent hiatus. But such massive undertakings are for cooler, more comfortable days than today’s high humidity heat wave. Instead, today, we look at another folk performer who grew up in not one but two households of folk musicians, and has since struck out on her own. Ladies and gentlemen: the various folk incarnations of Ruth Ungar Merenda. 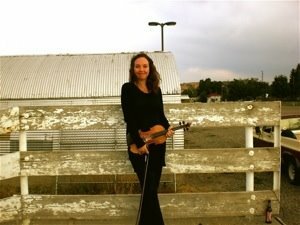 For a young folk musician, fiddle and uke player and vocalist Ruth Ungar Merenda has gone through a surprisingly large amount of performing groups and incarnations. Starting off as a childhood sidegirl determined not to follow in the footsteps of her mother, luthier and singer-songwriter Lyn Hardy, and her father Jay Ungar, who with Ruthy’s stepmother Molly Mason is a staple of the New England contradance and fiddlefolk revivals, Ruth headed off to Bard College, and from there to NYC, where she tried to make a go of it as an actress. But as with so many second generation musicians, it seems the music was in her blood. By her mid-twenties Ruthy had drifted back to the fold, making appearances throughout New England as part of the family bands. In 2002, with the production support of Jay and Molly, Ruthy released Jukebox, a sprawling solo album which tackled a few originals and a bunch of early country and jazz classics with powerful but still slightly immature vocals over a delicate old-timey charm and acoustic swing production. Though the album showed diverse influences, and would have probably done well in the track-by-track promotional model of today’s blogworld, back then it sold no more than a handful of copies. Luckily, even before she released her solo disk, Ruthy had found a different outlet for her sound, joining up with a few other younger folks, including fellow second-gen songwriter Tao Rodriguez Seeger and singer-songwriter Michael Merenda to become The Mammals. And this time, people started to listen. The Mammals emerged in the midst of a young person’s newgrass revival, finding fame alongside similarly female-voiced bluegrass and folkgrass acts such as Uncle Earl and Crooked Still. As fiddler and the sole female voice of the Mammals, Ruthy found herself front and center plenty; she also began to play with others backstage at festivals, and occasionally showed up with a few other women from those aforementioned groups in side projects and sidestages, even recording a slightly racy album with her compatriots Aoife O’Donovan (of Crooked Still) and Kristin Andreassen (of Uncle Earl) as the trio Sometymes Why after a successful jam session in a festival parking lot. I was lucky enough to see the Mammals several times in their few years together as an active performing group, both as a solo act and in tandem with Canadian-based folk group the Duhks (their performance together was billed as Platypus, as in Duhks+Mammals, which is just too cute). I liked the sound an awful lot, and I think their early release Evolver was a masterpiece of modern traditional folk rock. But seeing them in concert in their last year of performance, you could tell there was a hint of something in the air, just a faint unease in the way they clustered in threes and twos, rather than as a full ensemble, as if that there were some differences of opinion about what the “right” sound for the Mammals was supposed to be. These days, in fact, The Mammals are “hibernating” while their members pursue solo projects; for Ruthy and Michael Merenda, now performing as Mike and Ruthy, these projects included marriage, which came with a very generous wedding present of studio time and production for an album. The result was The Honeymoon Agenda, a complete set of originals and well-chosen cover songs which run the musical gamut from the urgent yet delicate one-guitar duet sound of Tom Waits cover Long Way Home to a surprisingly countrified version of the Velvet Underground’s I’ll Be Your Mirror to a grungy production-laden folkpop that rivals the best work of Evan Dando and Juliana Hatfield or Mary Lou Lord and Elliott Smith, or more recently, Signature Sounds indierockers the Winterpills — that latter being unsurprising, since it was the Winterpills’ producer who gave the duo the generous gift. This newest incarnation of Ruthy’s collaborative work is a far cry from the bouncy, almost renaissance sound of the contradance she grew up with, and it seems to have replaced the acoustic folk-slash-newgrass jam session sound of the Mammals work with a more intimate studio sound. Nor is it truly a return to the country swing-influenced singer-songwriter sound of her earliest solo work. Instead, though the record ultimately still shows an evolving artist in flux, it shows much more potential, in many more directions than before. It is lo-fi, but confident and mature in a way that Ruthy’s first solo work only hinted at. And, as in all Ruthy’s previous work, there is an energy and an honesty here which is well-served by her perpetual sense of whirlwind glee in making music, regardless of the style or subgenre. But why take my word for it? Here’s a few coversongs from each of these three major phases of Ruth Ungar’s adult career thus far, so you can hear her musical journey for yourself. The Sometymes Why album appears to include no covers, but it, too, has some great ragged moments. And all five of the Mammals albums, Ruth Ungar’s single solo album, and hubby Michael Merenda’s solo works are all worth checking out, too. If you’re up for some live music, and live in the NY/NE area, Mike and Ruthy will also be appearing at several folk festivals in the American Northeast this summer, including the always amazing Clearwater Festival and Revival on June 21 and 22, and New Bedford Summerfest in the first week of July, which I’ve never attended but very much hope to make it to this year; their tour schedule has more. And for those who are willing to make the trip, experimental folk trio Sometymes Why will be at Bonnaroo next week. In full, it’s an exceptionally busy schedule for any performer, let alone one who became a mother on January 28 of this year. Given Ruthy’s own irresistible pull towards the musicworld, I’m confident that we can expect to see little William performing alongside Mama, Daddy, Grandma Lyn, and Grandpa Jay before long. Today’s bonus coversongs offer a taste of Jay Ungar and Molly Mason’s typical contra-slash-swingfolk sound, as a roundabout way of exploring the deeper roots of Ruth Ungar’s musical journey.